Ah, the thirst for knowledge! Here, in The Information Age, you’d think it’s an unquenchable thirst, or perhaps we’ve become so used to being hyper-hydrated that we’re willing to drink from the well ’til we drown. Case in point: last October we tapped Adam Buchwald of Circle Strings for the Bench Press. Adam’s building some fine guitars, working in a shop that overlaps with another fine builder, Creston Lea, of Creston Electric Instruments. Creston was featured in the FJ #21, along with fellow Burlingtonian Paul Languedoc. That was way back in 2011. Things have changed over there in Burlington since we last spoke with Creston, so we figured it’s about time to check in with him again. 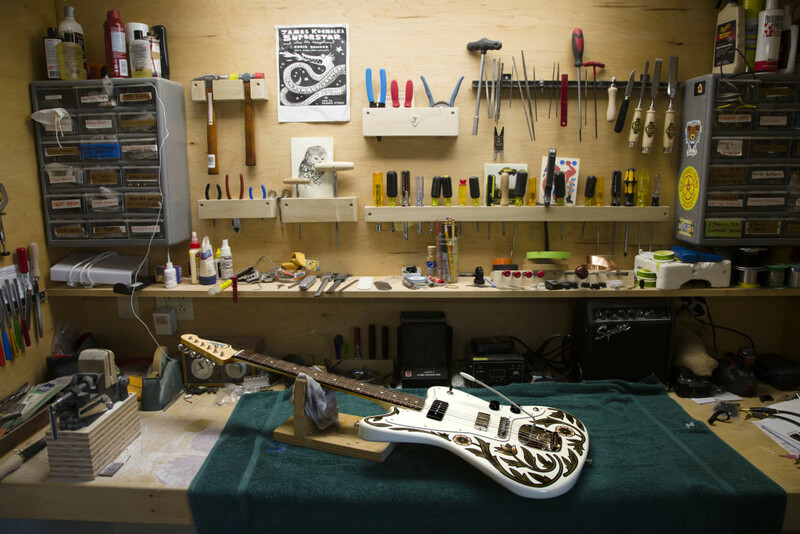 Fretboard Journal: What’s on your bench at the moment? Creston Lea: My soldering iron. I’m wiring up the controls for the next four or five guitars. Most are pretty straightforward, but one of them is making me spend a little time with pencil and paper, drawing the circuit. Sometimes I agree to these elaborate electronic configurations and just hope I’ll be able to figure out how to make them work when the time comes. I’m also finishing up an offset Sarah Ryan-painted guitar with Lollar Firebird and P-90 pickups. I’ve made a lot of guitars with those pickups for people who like Neil Young and Daniel Lanois but, for whatever reason, aren’t drawn to Les Pauls. It’s a great combination – the “both” setting is very articulate, but still powerful enough to make itself heard. Sarah’s painted nearly a hundred of my guitars, all of them great, but something about this one really pulls at me. The subtle variations on off-white shades and flat shapes on the pale base color seem just right. She’s very good at what she does. I recently revised the location of the tailpiece on that type of guitar and am very happy with the results. The Mastery stuff is beautifully designed and it gives me a small thrill every time I see my logo engraved on their vibrato. FJ: Can you tell us about the wood and construction techniques you’re using for the instruments you’re currently building? Anything unorthodox or new? CL: Last winter, Adam Buchwald and I drove over to Calais, Vermont where we met a renowned furniture maker named Peter Brough (his son, Brigham, plays bass in the band Elvis Perkins in Dearland). Adam bought a nice piece of mahogany for his acoustic necks and I traded Peter a case of fancy beer for four 3″x17″x8′ slabs of old growth spruce with super-tight growth rings. They’d served as an exterior wall of his house before coming out to make room for an addition. So-called plank wall houses are framed with thick planks of wood lined up vertically – siding on the outside and plaster on the inside. Who needs insulation when it’s only winter for like eight months a year in Vermont? I put them on the roof of my car and brought them back to Burlington, where they sat through the spring before I found time to get the nails out. When I moved my shop in June, the planks came with me, and now, a year later, I’ve begun making them into guitars. I just finished the first two, both with Lollar’s fantastic Regal pickups. They sounded great. I’ve got three more in the works right now – a bass and two guitars, one’s chambered, the other’s left-handed. Before 2015, I’d only made one left-handed guitar, but all of a sudden the lefties have found me. This is my third one this year. I also have some very nice wide butternut from Addison County, Vermont. The grain pattern can pass for ash under a transparent finish, but it’s a warmer-sounding wood, very lightweight. And I’m still using quite a lot of sugar pine, though my stash is dwindling and it’s often a tough wood for me to get. More than any other species, I really want to physically pick through sugar pine before buying it, and I have to drive three hours to my supplier and I never know what I’ll find when I get there. FJ: Where is your shop located? Anything unique or interesting we should know about your space? CL: After ten years, I moved out of the former Burlington Street Department building. Now I’m next to the train tracks at the very southern end of the city’s former industrial corridor, most of which – for better or worse – is quickly turning into office buildings, restaurants, and breweries. I bought a filthy old radiator repair shop and renovated it into three parts. I have about half for myself, Sarah has a small studio, and Adam’s Circle Strings operation is on the other side of the wall. 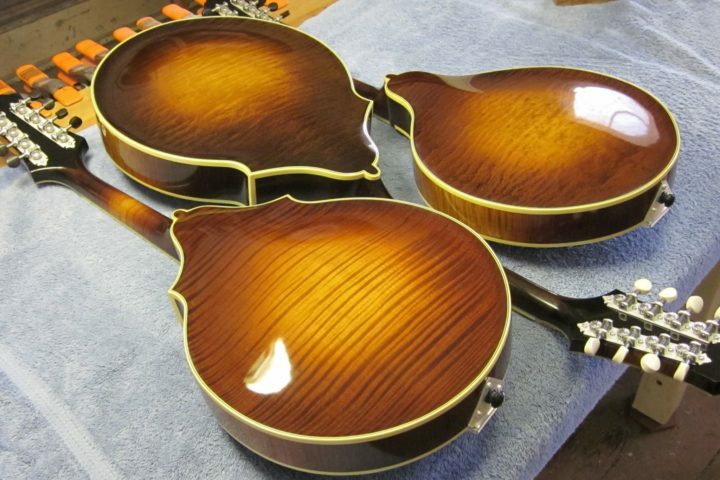 He builds acoustic guitars and mandolins and does a lot of high-end repair work. I didn’t know what to expect, but it’s proven a perfect arrangement. I really like to work alone, but I’m a social fellow. It’s nice to have somebody to eat lunch with. I’m always knocking on Sarah’s door to get her opinion about which knobs to use or how to mix a particular color. Adam makes a pretty good neighbor if, say, you need to borrow buffing compound, sign-maker’s tape, a gooseneck scraper, a scrap of Brazilian rosewood, glue accelerator, etc. etc. etc. Adam’s recently gotten in deep with CNC technology, so we’ve been working together on producing parts for my guitars that way. 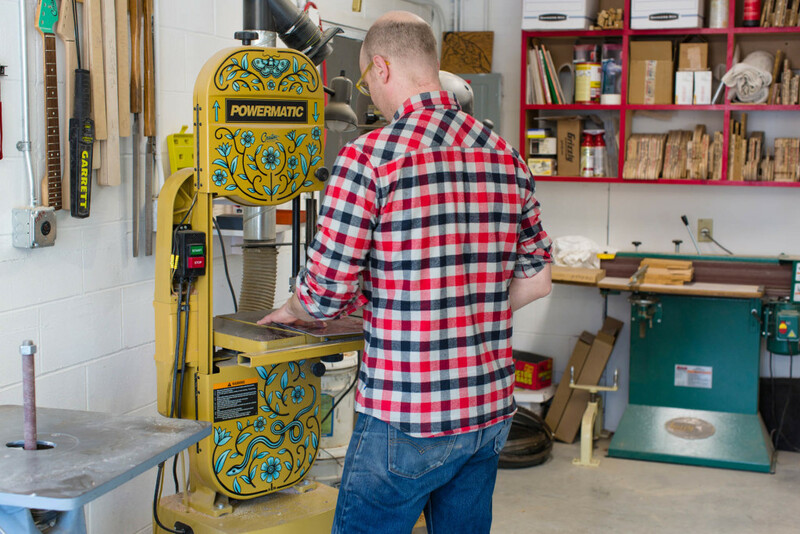 I’m still mostly using the same plywood templates and double-stick tape I’ve always used, but the CNC machine next door has me exploring some ideas I’ve been carrying around for years – mandolin family instruments and lap steel guitars, particularly. FJ: Lap steels, you say? CL: I had a bunch of hardware for lap steels made a few years ago – silkscreened aluminum fretboards and control plates, some beautiful bridges – and then only managed to eke out one lap steel. I was so fixated on making it indestructible, I made some dubious decisions in headstock design. All the same, the band Son Volt toured with it for a couple years and it sounded good when I saw them play. At the insistence of a great player who already has six of my guitars, I’m finally getting around to revisiting the design. He wants a version on legs, so I’m currently studying the thrilling subject of telescopic steel guitar legs. I’ve been lucky to have a lot of repeat business, and it’s often those people who push me in new directions. When you’ve made ten guitars for the same guy, it’s harder to say no to a fourth pickup behind the bridge or purple lacquer. FJ: Do you have general design philosophies? CL: More than anything, I want to be excited about every guitar that I build. That means saying “no thanks” to a lot of queries, but nobody is well-served by a lack of enthusiasm. 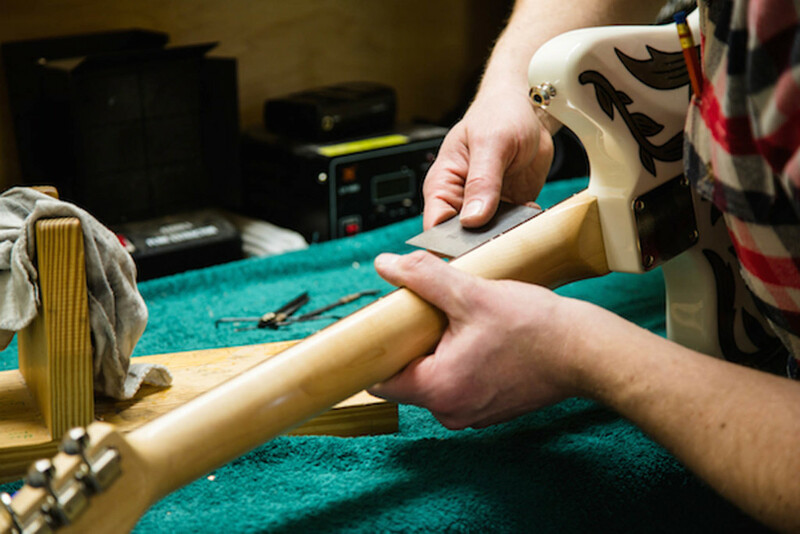 There are plenty of good guitar builders in the world, so players might as well work with somebody who’s like-minded. Sarah’s decorative paint aside, I try to keep guitars simple. I avoid figured woods and inlay and jewelry box hardware. I want the guitars to look timeless, but I also don’t want to replicate exactly anything somebody else has already made – or even something I’ve already made. I push my clients to choose colors unique to themselves and to pare down the electronics as much as possible. With very rare exception, I make everything to order. So I want each guitar to be very personal and meaningful to whoever’s ordered it – the sound, the feel, the look. On the other hand, I work with a lot of people who are new to custom guitars and feel the newcomer’s impulse to make it ever-more-custom by adding and adding and adding. I try to be the voice of reason and talk them down to what’s realistically functional and necessary. If they insist, and the idea isn’t patently bad, I usually capitulate. And that’s how I end up installing analog delay circuits or multiple output jacks. FJ: What’s your wait time at the moment? CL: About two months. 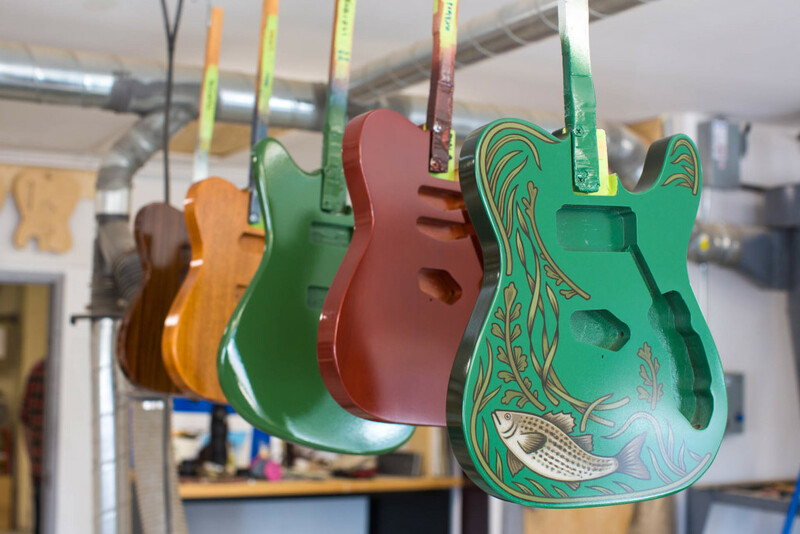 I took a lot of orders after the premier of Bill Simmons’ short documentary about my guitars. It caused a bubble that slowed things down by a couple of weeks, but that’s mostly passed now. I get nervous when I have too many guitars in the works, so when the list grows to twenty or twenty-five guitars, I generally stop taking orders for a little while. 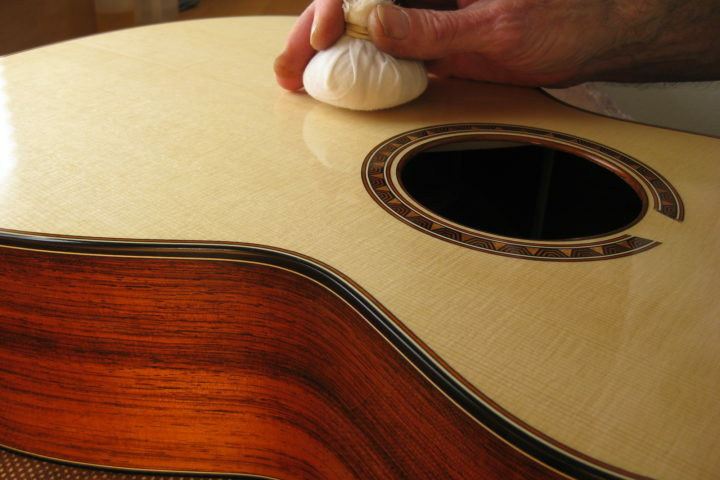 I feel best when there are about eighteen guitars going – some just starting, some near assembly. I’ve found that some of my most monumental revelations have come during those breaks. Sometimes taking the pressure off lets a new idea in. When Sarah’s involved, the turnaround depends on whatever she’s got going at the moment. We both have kids, so school vacations and flu season occasionally monkey-wrench the timeline. FJ: Any specific instruments from your past you want to mention? CL: In the wake of Bill’s film, I’ve been thinking a lot about the first guitar I made for Mark Spencer over a decade ago. As years go by, I realize – much more than I did at the time – how much it set the course for everything that’s followed. When I first started building guitars, I thought I was supposed to replicate the factory-made guitars I’d been playing. 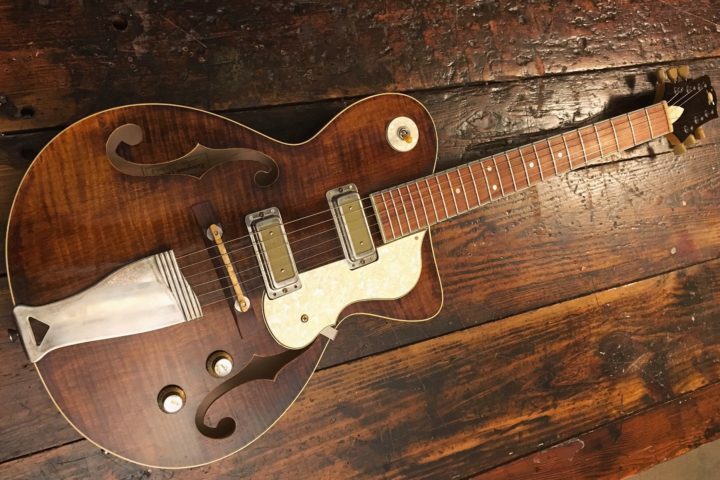 But with that guitar, I stumbled into using bolt-on neck construction with Les Paul Junior-style electronics, unusual colors, and – dipping into a spare parts bin – an old Ibanez top-loading bridge that I modified for use with a P-90. I regularly see guitars with those features now, but at the time they seemed very new. Top-loaders had a bad reputation, but I soon adopted them as my stock in trade. I haven’t used anything else for many years. Lots of outfits are manufacturing truncated 3-saddle bridges now, but I used a bandsaw and metal files to modify hundreds of off-the-rack assemblies. I saved all the off-cuts for no justifiable reason – a cumbersome pile of nickel-plated collateral damage in the struggle to pair Telecaster-style bridges with P-90 pickups. When I was packing up my old shop I mailed a few dozen to a guy who thought he could find a use for the scraps. Hard to imagine any good can come of that, but who knows? Mark was on the road with Lisa Loeb and Jay Farrar at the time. The guitar was so unusual, it got a lot of attention and I started taking orders. His professional musician friends – players like Chuck Prophet and Eric Heywood, whom I’d admired but never met – started calling. Before long, I wasn’t doing carpentry work anymore. That guitar was a happy collision of instinct and accident, but I’m awfully glad it came together and showed me a new direction to follow. I’ve made five or six more guitars for Mark since then, but he still plays that first one a lot. We’ve replaced the pickup with the alnico-pole soapbar that Lollar makes for me – I call it a LEA-90 – but otherwise it’s unchanged. FJ: Anything coming up in the future you are particularly excited about? CL: I’m very excited about my new shop. For one thing, it’s warm in here. That’s an overdue change from the old place, which was often as cold in the morning as the weather outside. And my new spray room is much more deluxe. My guitars are always getting better, probably always will, but I think this move heralded a nice step forward. I’m happier here, and that can’t hurt. I just bought an enormous resaw bandsaw, which makes the prospect of chambering bodies or milling rough wood much easier. I’ve relied on others for resawing wide planks in the past, so it feels good to be wholly self-sufficient. Any day I can spend at my shop without leaving feels like a good day.